SUMMARY: Another Canadian airline has shut its doors again, as IMP Group’s CanJet Airlines has packed it in after 15 years of trying everything to be successful, from being sold to Canada 3000 and then revived, then went into scheduled services, then went into charter flying for tour operator Sunquest followed by ACMI flying for Air Transat and when that ended a failed quick and poorly planned attempt at becoming a tour operator as well, but CanJet Vacations lasted 2 months at best, again poor execution of a business plan and now it has run out of ideas. The airline has run the gauntlet of airline business models without any long term success or profit, the problem is more to do with execution than the business plans used, a common Canadian aviation problem. Now it will dry lease out its last 4 x B737-800’s and return them to their owners in May, 2016, but with no operations the AOC will be gone, and that is worth something for Canada’s aspiring ULCC start-ups like Canada Jetline or Maple Leaf Travel who have no AOC or money right now. Canada needs a ULCC, the business model is proven and LCC companies like Indigo Partners LCC and Irelandia Aviation surely would love to give it a try in Canada where 85% of domestic travel is in the hands of the duopoly of Westjet Airlines and Air Canada. Why are airlines like Air Transat allowed to lease in 10+ foreign B737-800’s on ACMI leases when Canadian aircraft and crews are available ? foreign ACMI leases should be allowed only when there is no Canadian lift available, time for the government to investigate this matter. As expected (my Blog May 19, 2015), Canada has lost another airline last week, when CanJet Airlines, shut down the operation of its last operational Boeing B737-800 which was operating on an ACMI lease for Air Transat out of Toronto, and was downgraded to just a dry lease, forcing the company to furlough its last 13 pilots and 35 flight attendants. On September 1, 2015 Canjet Airlines (ABOVE left) shut down its operation of its last B737-800 saying it is redoubling its efforts to find a new profitable business plan ?? business plans are nothing with out proper execution, the history of Canjet Airlines is one of failed executions of business plans. Lastly, while Air Transat can ACMI foreign B737-800’s (ABOVE photo right-French registered Air Transat B737-800 on ACMI lease), when there are 4 Canadian B737-800’s available to do the job is not right either, ACMI should be allowed only when there is no Canadian lift available. CanJet Airlines was always a troubled airline under the ownership of IMP Group which is privately controlled by the Kenneth C. Rowe family (Executive Chairman) out of Halifax, Nova Scotia. The airline was started in 1999 and it has had many up and downs as it bounced from one business model to another, like a ship without a rudder, going where the wind blew it, but never stayed the course for too long. Now IMPG Group started as International Maritime Products (IMP) over 45 years ago, and today it has greatly diversified away from its fish industry beginning to being a big player in aerospace and defense, aviation, healthcare, IT services, customer care to real estate development and resorts, hotel and property management. While IMP Group is a private company, little financial information is available, but based on its published 4,500 employee count, revenue is most likely around $C1.0+/- billion a year by my estimate (annual revenue of $C 225,000 per employee). In the aviation and aerospace industry the company had bought highly successful Cascade Aerospace Inc. (Abbotsford, B.C. ), a large MRO and aircraft support company with defense and civilian contracts as well as acquiring Image Air Charter Limited of Toronto with its 20 business jets under management to add to its own Innotech-Execaire Aviation Group’s 30+ aircraft under management, and today is Canada’s largest business jet operator with over 55 business aircraft under management across Canada. 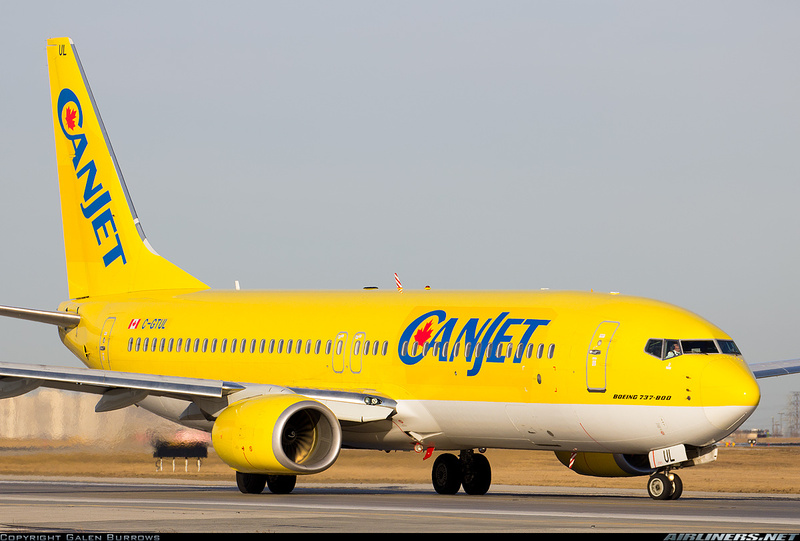 The President of CanJet Airlines, Stephen K. Rowe suspended the operation of the last B737-800 on September 1, 2015 and that the company will dry lease out the aircraft 4 remaining B737-800’s until they are to be returned to their respective owners/lessors in May, 2016. At this time the lease rates for B737-800’s can be anywhere between $275,000 per month for a 15 year old model up to $375,000 for a 5 year old model, so with 8 months to go till the aircraft are to be returned, CanJet Airlines is looking at around $US 10 million in lease payments. “The reason that we suspended flight operations today was really two things, basically operating one aircraft is not a very profitable exercise as you can imagine”. “And also as a company, we haven’t had the ability to identify a market opportunity that we can move forward with confidence in obtaining and being successful”. “It’s a sad day for the company, we’ve been operating aircraft for 20 years and hopefully maybe one day we can find that business plan that we can get back operating again”. These comments are interesting as it looks as if IMP Group wants to continue in the airline business, but waiting for better business options as they become available ? The sad reality is that they have tried all the segments, scheduled services, ACMI operator to leisure/travel air operator with its own CanJet Vacations, but could not get anywhere in any of the market segments in tried. The sad truth is that CanJet Airlines had many opportunities since 1999 to establish itself in Canada, but failed at every step to execute on its Business Plans. In 2000, West Airlines was still a small airline going after the low cost market in Western Canada, yet Eastern Canada was wide open for a LCC, but in March 2001 CanJet was sold to Canada 3000 for $C 7.5 million in stock ? while Royal Aviation owned by Michel Leblanc was bought for $84 million and that should have been the end, as by November 2001, only 6 months after starting scheduled services, and 8 months after buying CanJet Airlines, Canada 3000 collapsed ! So, June 2012 comes along, and Canjet Airlines becomes a scheduled airline 1 year after JetsGo is started by Michel Leblanc with his $84 million from Canada 3000, but there was an opening in Eastern Canada for a LCC and CanJet tried to establish itself with 10 x B737-500/300’s and moved to Hamilton in April 2004 after WestJet moved its operation to Toronto Pearson. JetsGo went bust after 3 years in March, 2005 and by September, 2006 CanJet called it quits for regular scheduled flights to its 15 destinations, after 51 months of effort. Then in September, 2006 it became the a contract charter operator for tour operator Sunquest, and by 2007 it reached its peak with 570 employees. While CanJet Airlines had its contract flying with Sunquest, Sunwing Airlines, owned by the Hunter family and formed in November 2005, was expanding, creating economies of scale with up to 38 x B737-800’s today and having bought several tour operators along the way. The Canjet Airlines deal with Sunquest lasted 30 months and then once again in February 2009 Canjet flocked to another opportunity, this time a 5 year agreement with Air Transat to provide up to 6 x B737-800s, as the tour operator/airline had no narrowbody aircraft at the time, and the relationship lasted for the 6 years until February 2015 when Air Transat decided it will get its own B737-800s, a move Canjet Airlines should have seen coming if it was on the ball, and should have acted accordingly before the hammer fell. The airline had 6 years with Air Transat to formulate a long term strategy, they saw Sunwing Airlines grow, multiple European airlines flying from Canada on ACMI lease contracts on behalf of Sunwing and Air Transat, including an operator I know well from my days in Eastern Europe, Travel Service (Czech Republic) when it started with a single TU-154 and then a single B737-400, and a good client of mine, from aircraft insurance to me helping them set up LCC Smart Wings. 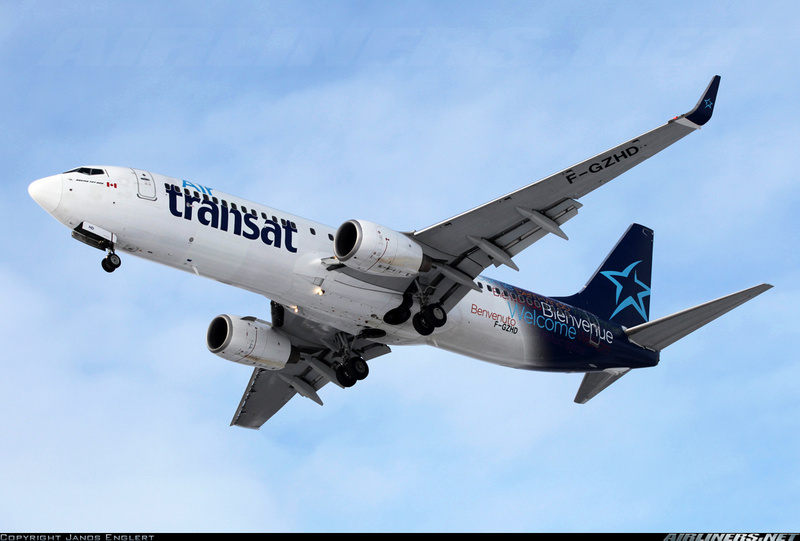 Anyway, as expected the Air Transat contract ended this past February, and CanJet Airlines was caught flat footed, it rejected the summer’s European ACMI flying as not profitable enough, and in April laid off most of its staff, and grounding 5 of its 6 B737-800’s as it had no work for them ? as an aircraft and charter broker, my good there are so many lucrative ACMI contracts available out there from SE Asia, Middle East, Africa so I don’t understand that. Unless, the costs at CanJet Airlines are too high. As for Air Transat, they ACMI a lot of B737-800, as there business is very seasonal, as November to April 80% of travel is south while May to October 80% is travel to Europe and France. The airline still struggles to restructure, net income of minus $C39 million in 1st half of 2015 and hopefully the 2nd half of the year will overcome the loss, cost reduction still under way along with some margin improvements as summer fleet is 21 wide body aircraft (A310 and A330) and 4 Air Transat B737-800 and 1 x B737-800 from CanJet, meanwhile 10 x B737-800’s will be wet leased (ACMI) this winter from Europe ?and only 13 wide body will be available. This is an airline that is struggling and things are getting worst as WestJet has begun trans-Atlantic services and just received its first B767-300ER, while Air Canada’s LCC rouge expands Carribean and European operations, something needs to change at Air Transat in a big way. Wet leasing is where one carrier (the lessee) obtains an aircraft and flight crew from another carrier (the lessor) to operate services for the lessee under its AOC and license. The lessor is in operational control of the aircraft and the lessee is in commercial control of the aircraft. Widely used around the world in seasonal traffic areas (e.g. Europe is busy in the summer, Canada is busy in the winter-Caribbean destinations), keeps the aircraft flying as much as possible, as new narrowbody aircraft should average 3,300+ hours per year (9+ hours per day). In February of this year proposed ultra low cost carrier (ULCC) Canada Jetline had talks with CanJet Airlines about buying its AOC and using it to start their planned operations in Canada and the US, but apparently the cost structure of CanJet was too high for a ULCC, that is probably one reason the airline has suffered for so long. The ULCC model has big potential in Canada, and 3 planned start-ups are looking to fill the void in Canada, Jet Naked, Canada Jetline and NewLeaf Travel, a market exists but you need money and a team that will execute the ULCC model. In Canada, since my return from 20 years in Europe, I have sadly see many poorly run Canadian aviation companies, outdated management styles, no clear vision and just poor execution of plans, too much of the industry is run as it was 20 years ago. At a Canadian business jet operator, I saw a company with lots of plans but no execution capability, poor managers, lack of communication, desk bound business development and no leadership, with the same people for 15+ years doing the same over and over expecting different results, which equals insanity ! and I have seen it at many more operators in Canada, Canadians do not value new ideas, international experience, just do as we have always done, mediocrity has crept into the industry and any outsider can spot it very quickly. The business jet business in Canada (510 business jets) is dominated by 4-5 big management companies, they grow by “stealing” from each other client management contracts, which then brings on fuel sales, maintenance, charter revenue, management fees, but there is no differentiating and yet in Europe you see consolidation, lots of innovation like business jet operators cooperating with large airlines on VIP flying and just more life in the industry. I know, I had 2 executive jet charter companies in Europe, and Canada is sadly no comparison, in Toronto it is all about who has hangar real estate these days to handle the big iron aircraft. CanJet Airlines had and has opportunities as a ULCC, but it needs new management, as it has shown it is not able to execute a business plan, it went where ever the wind blew, no competitive advantage, no differentiation, just waiting for opportunities when “hope is NOT a strategy” you have to make your opportunities. Canada needs a low cost airline, and the best for that are Indigo Partners LLC who own LCC Wizz Air, Frontier Airlines, Tiger Airways, etc. and I know personally that William A. Franke and John R. Wilson were/are looking at Canada. CanJet has an AOC for B737-800’s, it has value, if they are not operating aircraft they will loose the AOC off course. There is Irelandia Aviation, a specialist in LCC development, Ryanair, Tiger Airways, VivaAerobus, VivaColombia, Allegiant and now VivaLatinamerica. And go an see Declan Ryan and talk to them, Canada is a big country, 34 million people and dominated by the duopoly of Westjet and Air Canada (85% of domestic market). I just find Canadian operators have no fire, no passion to do new things to change things, everyone is too comfortable waiting, hoping for change or opportunities, very sad. With experience with over 60 operators and aviation companies in my career, I know what it takes to get things done, and I can spot an inefficient, mismanaged company very quickly. In CanJet Airlines case, I see the inability to stick with a plan and execute a business plan, they have tried it all, but how well they went about it I would question. A business model has 4 key components, customer value proposition, key resources, key processes and a profit formula. The models change, look at ULCC Rynair, now customer friendly, serving primary airports to serve business customers, using GDS’s because it had to change, that is ok, you have to adapt to market changes. The case of CanJet Airlines is an example of not building on your strengths, I watched a little company in the Czech Republic, Travel Service go from a single B737-400 to operating 25+ B737-800’s today, undertaking ACMI lease all over the world (with 4-6 aircraft in Canada every Winter), setting up its own LCC Smart Wings and become a global company from a very small country, because it had leadership (Roman Vik), a direction and strategy all employees bought into and jumped on all opportunities that made a good return, it’s not rocket science, it comes down to people and leadership which sadly is lacking in many of Canada’s companies, as they are content with the status quo, yet all can do better, but no one wants to, it’s too much work and they after many years in the same company, few know how to change things. In closing I hope CanJet Airlines is revived one day, but it needs to be proactive and not wait for “one” day when they may see the light, and the same applies to its Innotech-Execaire, so much potential for consolidation, differentiation and growth, but need to change mind sets stick in the past. Till next time, cheers and thank you again for reading my blog. « UPDATE: of June 8, 2015 article – Evektor s.r.o. the Czech design office that is behind the Evektor EV-55 Outback, a 10-14 seat twin PT6A-21 powered un-pressurized STOL utility aircraft with so much sales potential, is struggling to make headway after the takeover of the company by Malaysian investors who are very new to the aviation industry. The market for a twin engine competitor to the Textron Aviation Grand Caravan is out there, but certification is going to be a major challenge for the inexperienced Czech/Malaysian company. The company has been hit by several major lawsuits for several accidents with its small LSA (light sport aircraft) 2 seat SportStar aircraft (produced by its 66% directly and 34% “indirectly” owned Evektor-Aerotechnik a.s.) and by a lawsuit from its ex-USA dealer, which has resulted in the Czech court freezing the bank accounts of Evektor-Aerotechnik a.s. in regard to a $3.2 million judgement against the company in a Florida court, forcing the company to file for “reorganization” (+/- US Chapter 11 bankruptcy), which is presently in insolvency. The Malaysians and Czechs are way over their heads with this program, and with no sign of the MSN 002 prototype (the first production standard unit) flying any time soon, certification is 3+ years away at best and it starts when MSN002 starts flying (1Q/2016 ?) and in no way will it deliver the first certified aircraft in 2017 as promised to its Malaysian launch customers, in fact, the program has a low probability of ever making it through certification, production and commercialization as it stands now. All indications point to a possible sale of the program to a ‘foreign’ OEM (e.g. China) as EASA certification will take much longer than they planned, and apparently there are no plans to sell the aircraft in the US market, meaning no FAA certification, which reduces the market potential of the aircraft by 70% at least, so where is this going ? and what about the $50+/- million the Czech Government invested in the program ? the aircraft is only possible thanks to the tax payers of the Czech Republic and the shareholders of Evektor s.r.o. should not be profiting from its sale if the EV-55 is not going to be certified and built in the Czech Republic, time for the Police to investigate the whole thing.